The Nintendo Powerfest was a contest held in 1994 to crown the top video game player in the United States. Competitions were held throughout the country, and top scorers were sent to San Diego to compete for the crown. Recently, a copy of the cartridge used in the competition was found, and an interesting (if under reported) event in the 16-bit era is revealed. 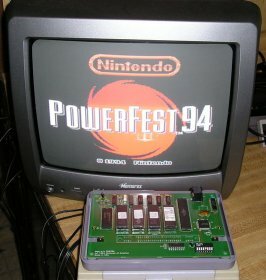 The Powerfest 94 competition was an attempt at Nintendo to replicate the success of the Nintendo World Championship held in 1990. For whatever reason, this competition never reached the notoriety of the original competition. Perhaps it is because they did not distribute the competition carts, giving a certain mystique over Nintendo fans that the NWC did. Or perhaps it was because of the competition of the Genesis at the time that sort of dried up the hype that Nintendo produced when it was the only player during the 8-bit era. Regardless, very little of the Powerfest 94 competition was known except for an article on an obscure website written several years ago. That page gives an excellent account of the competition from someone who competed at it. Back in mid 2006, jollyrancher acquired the Powerfest 94 cart (as well as the Campus Challenge cart and uncovered this long forgotten gem. The odd shape of the cart was used for Campus Challenge cart, as well as the PlayStation CD ROM prototype. The cart is a bit of a monster, containing several eproms (one for each game, as well as the front-end) and a DSP chip (for Mario Kart). According to d4s, each ROM chip was loaded separately into the snes when it was accessed, and the score data kept on the ram. There are 8 Dip switches that work to change the amount of time you get to play the cart. There were three games included in the competition cart. 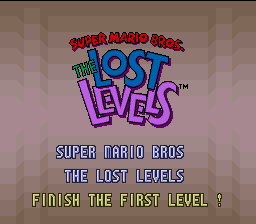 In the first section, you played level 1-1 of Super Mario Bros: The Lost Levels. In the second section, you play the first track of the Mushroom Cup in Super Mario Kart. The final part was the home run derby in Ken Griffey Jr. Presents Major League Baseball. Much like the NWC, the most points were made in the final game, so finishing the first two games as quickly as possible was key to victory. In the Powerfest competition, the home runs counted for 10,000 points at in the regionals, but in the finals, the value was upped to 1 million points. It is interesting to note that the Dip switches do not change the score you get in Ken Griffey Jr. Baseball, so there perhaps were different versions of the competition cart. The score in Mario Kart is based on how you place in the race, and how many coins you collect. In the competition, you were given 6 minutes to score as many points as possible. To qualify for the Powerfest tournament, you had to get a high score on the Powerfest cart during Nintendo sponsored events throughout the United States. Regional qualifying events went from May to November. At the events, there were four systems set up, and whoever won on each go got a hat. The top qualifier for each event got a trip to San Diego to participate at the championships. The runner up got a Starfox jacket (presumably) left over from the Starfox Super Weekend Competition. The top qualifiers were flown to San Diego on November 18-20 for the Nintendo World Championship. 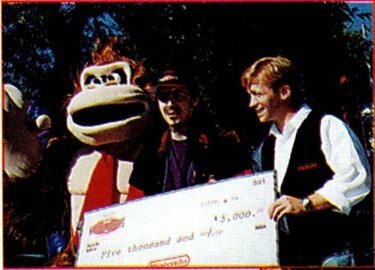 Competitors got to participate in many Nintendo sponsored events, and visit Sea World. The competition went ahead on November 20th. The competitors were separated into four teams, based on the four regions of the US. The preliminaries consisted of 9 rounds of 16 players, where they would once again compete with the Powerfest competition cart. The top 16 players advanced to the next round. All competitors received a copy of Donkey Kong Country, which was released a week after the competition. From the final 16, additional rounds were played until there were 4 players left. The final four people were in for a surprise, as they would compete using a timed version of Donkey Kong Country (used the subsequent year in the Blockbuster Championships the following year). After a practise round, the four competed, with Mike Iarossi and Brandon Veach making it to the finals. After the finals, Mike Iarossi ended up victorious. The prize for victory was a Mustang! Much like the Campus Challenge competition, the Powerfest languished largely in obscurity until recently. It is fortunate that this piece of video game history is now out in the open for all to enjoy. Be sure to check out the links at the bottom of the page to check out more in depth analyzes of the Nintendo World Championship 1994, as well as videos of news stories that cover the event.